One of the most charming things about the 1991 Steve Martin romantic comedy "FATHER OF THE BRIDE," (besides Kimberly Williams, of course) was the home where 'George Banks' and his family lived. In the movie, it was supposed to be in San Marino, CA. In fact, it was actually a few blocks northwest of that town, in the southern section of Pasadena. The address is 843 S. El Molino Ave., in Pasadena. The house was also used in the 1995 sequel, "FATHER OF THE BRIDE 2." 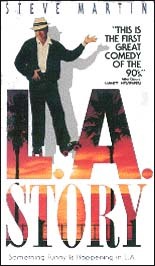 And speaking of Steve...Remember the scene in the 1991 comedy "L.A. STORY," where Steve Martin roller skated through the marble halls of an art museum? Well, that museum was the Los Angeles County Museum of Art (LACMA), in Hancock Park (5905 Wilshire). In that same movie ("L.A. STORY") Steve Martin later roller-skated through a second museum, this one filled with abstract art. That was the Museum of Contemporary Art (MOCA), at 350 S. Grand, in downtown L.A.
"L.A. STORY" also features both interior and exterior shots of the Hard Rock Cafe (at the Beverly Center), during the scene where a nervous Steve Martin first dates the much younger Sandy (Sarah Jessica Parker). It's the glitzy burger restaurant where she writes her name on the palm of his hand ("SanDeE*") while munching french fries. In "HOT SHOTS," the 1991 spoof of "Top Gun," with Charlie Sheen, the funeral scene was shot at the lake in Hollywood Memorial Cemetery, next to Paramount Studios (at Santa Monica Boulevard and Bronson Avenue) in Hollywood. A scene from Steve Martin's "L.A. STORY" (involving a funny gravedigger and a "Hamlet" take-off) was also shot there. In that same movie ("HOT SHOTS"), the aircraft carrier (which was supposed to be out at sea) was actually a large outdoor set built on dry land, on the former site of the old Marineland of the Pacific theme park, a hilltop location which overlooks the ocean (on Palos Verdes Drive, south of Hawthorne Boulevard, in Rancho Palos Verdes). The Beverly Center mall in west Los Angeles (8500 Beverly Blvd.) pops up in movies now and then, in part because of its eccentric exterior, conspicuous for its twisting, glass-tube escalators. Most notably, the mall starred in the Woody Allen / Bette Midler 1991 comedy, "SCENES FROM A MALL." The exterior shots were done there, but the interior scenes were shot at Stamford Town Center in Connecticut, chosen because it resembled the Beverly Center. Speaking of malls, during the opening credits of the 1990 action/comedy "KINDERGARTEN COP," Arnold Schwarzenegger stands atop a bridge in an upscale shopping mall and looks down at a blue pool below. Then he follows the bad guy through the mall and eventually busts him. That scene was shot at the MainPlace/Santa Ana mall, near Disneyland (2800 N. Main Street, Santa Ana). That same MainPlace mall in Santa Ana was the setting for an early scene in the 1994 sci-fi thriller "TIMECOP, " starring Jean-Claude Van Damme, where he follows his wife up an escalator while the two flirt as if they didn't know each other. Remember the fancy restaurant in 1990's "PRETTY WOMAN," where Julia Roberts accidentally tossed an escargot shell across the dining room - only to have it caught by a waiter ("slippery little devils!") ? Well, that posh restaurant was Rex Il Restorante, one of the city's most expensive restaurants (at 617 Olive Street), in downtown L.A. Its space now houses Cicada restaurant, owned by Elton John's lyricist, Bernie Taupin. And speaking of "PRETTY WOMAN," the final scene of that movie saw Richard Gere returning to 'rescue' Julia Roberts, Cinderella-style, from the balcony/fire escape of the shabby Hollywood motel where she was living. That rundown motel was exactly that - in real-life it's called the Las Palmas Hotel, and it's located at 1738 N Las Palmas Ave, in Hollywood, just a block north of Hollywood Blvd (right before Yucca St.).